If you or a loved one has been seriously injured due to someone's negligence, it is important to retain counsel who can help you heal, recover and elevate your quality of life as best as possible moving forward. 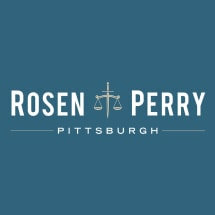 At Rosen Louik & Perry, P.C., our Pittsburgh, Pennsylvania, personal injury and medical malpractice lawyers focus on helping victims recover the compensation they need to rebuild their lives and ease financial burdens. In our decades of practice, our attorneys have recovered record-setting settlements and verdicts that have allowed our clients to live their lives with dignity. Our law firm is a leader in medical malpractice, an area in which our lawyers possess the unique advantage of having on staff full-time physicians and nurses. The attorneys have successfully represented clients with medical malpractice cases in numerous areas including concerning birth injuries, gastric bypass surgery, failure to diagnose cancer, surgical accidents, nursing home negligence, medication errors and other medical accidents, including those leading to brain injury or wrongful death. In addition to medical malpractice, our attorneys handle serious personal injury claims arising from car accidents, motorcycle and trucking collisions, construction and industrial accidents, dog bites, accidents caused by drunk drivers, and other types of personal injury lawsuits in western Pennsylvania and Pittsburgh. Our philosophy is that our clients are courageous people. Our goal is to relieve them of their financial burdens. If you or a member of your family has been seriously injured as a result of negligence or medical malpractice, it is important to have your case reviewed by an experienced medical malpractice lawyer or personal injury attorney before talking to any insurance company. We offer free initial consultations and take all injury cases on contingency, meaning you will never be required to spend any money seeking the justice you and family deserve. At Rosen Louik & Perry, our medical malpractice attorneys are committed to holding medical professionals responsible for their mistakes. If you or a member of your family has suffered a serious injury, it is important to recover the resources you will need for medical care and other necessary expenses. We invite you to contact us for a free consultation and case review. If you suspect your child's birth injury was the result of obstetric or hospital negligence, we will help you get the answers you need. Contact our office to arrange a free consultation. If someone you care about has experienced injury or death as a result of weight loss surgery contact our office to schedule a free consultation. If you or a member of your family has suffered a serious injury in a commercial trucking accident please contact our office to arrange a free telephone consultation.